Where: Greenbelt Youth Center (99 Centerway, Greenbelt, MD, 301-397-2200). The Youth Center is easily accessible from Greenbelt Road and Southway (Southway becomes Centerway). When: The Youth Center will open at 12 noon on New Years Day. Restrooms will be available. Race registration begins at 12:15 p.m. Race day registration only. All participants will be required to sign a waiver. The two races begin at 1 p.m. and the course loops around Buddy Attick Park. There will be one water stop at the bridge and a marshal there as well to make sure the shorter distance runners turn off to the left at the right time. Awards: First three finishers in each category, for each race. Categories are: Ages 49 and under, Ages 50 and over (Male and Female). This is the first PGRC race of the year.The race is FREE for everyone! No racing in the case of lightning or thunder. Join PGRC this Saturday in Mitchellville for our monthly “We Run the County” run. This monthly event is open to current and prospective club members, as well as visitors. No registration or fees, just show up! When: 8am Saturday June 25. Distances: The base route is from the community center and around a nearby lake. It is almost 4 miles exactly. By adding more laps of the lake (about a mile), you can add more mileage. There are also a bunch of other options for adding miles with the many neighborhoods nearby. From the Beltway north (Greenbelt, Laurel): Coming southbound, take exit 17 (MD-202, Landover Rd) Merge onto MD-202E (Landover Rd) Turn left onto Lake Arbor Way Turn left onto Campus Way N. The Community Center will be on the left. From the Beltway south (Ft Washington, Clinton): Coming northbound on the beltway, take exit 15A (MD-214, Central Ave) Keep right at the fork and continue on MD-214E Turn left onto Campus Way N. The Community Center will be on the left. 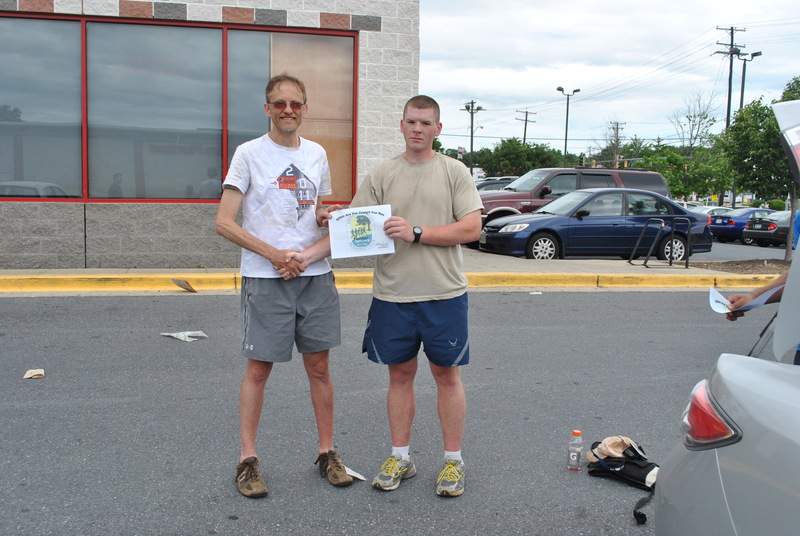 Congratulations to all who participated in the 2011 Springburst 8k. 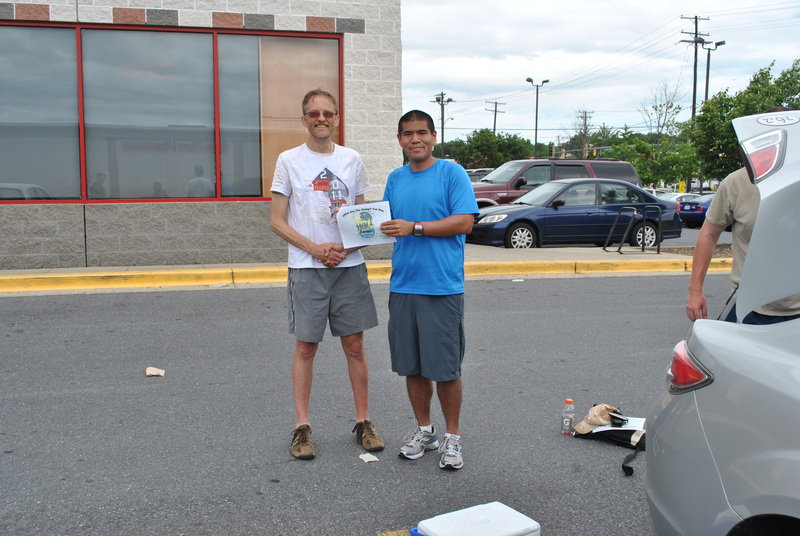 Kudos to event directors Cass Logan and Kim Ossi van Brecht and all of the many race volunteers. PGRC was selected by the RRCA to host the Weight Watcher Walk-It 5k. The non-competitive walk will be held on Sunday, May 22, 9 am, at Lake Artemesia, off Paint Branch Parkway in College Park, MD. On April 16, PGRC will sponsor a free, 6-week walking program. Participants will meet at Lake Artemesia at 8 am on Saturday mornings (details will be announced later on the PGRC website). Many PGRCers participated in yesterday’s National Marathon, Half Marathon, and Relay. And the PGRC group at the mile 15 aid station, led by Yvette Lumpkins, did a fantastic job of keeping the marathoners hydrated and motivated for the second half of the race. Here’s a partial listing of yesterday’s finishers- I know I’m missing a bunch of people so please comment below with your name and finish time and I’ll add you to the list.